Make spelling fun with spelling games! These free October spelling test for 10, 15, or 20 words with dictation can make spelling like a game. These are great for kids in 1st, 2nd, 3rd, 4th, 5th, and 6th grade. Spelling tests are a simple, easy way to asses how well children are learning to spell words. And when you use fun templates, it makes it like a game! 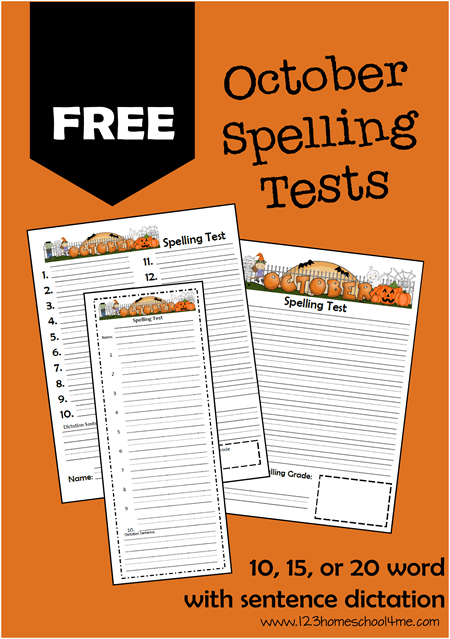 Make spelling test fun with these free seasonal, October Spelling Test for K-6th grade. These work for 10, 15, or 20 words with or without a dictation sentence.